So, yeah. 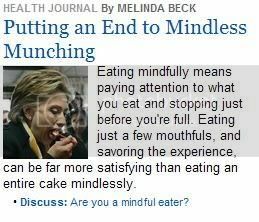 The new women's interest section of the Wall Street Journal posts a headline to a par-for-the-course "health" article cautioning women not to overeat, and even though the article doesn't metion senators or presidential candidates in any way, someone decides to slap a random photo of Hills stuffing her face next to it. The implication? HRC is a mindless (a great word to pair with a female presidential candidate, huh?) eater who regularly shovels food into her mouth without thinking about it. She's letting herself go! And you don't want to be like her do you? No woman is immune from public scrutiny of her diet: not even if you are rich, white, able-bodied, post-menopausal, and a US Senator can you avoid being used as a cautionary tale of The Dangers of Women Eating. Read her whole post and the comments for more on how the whole article (and not just its presentation) is problemetic. Want to tell the Wall Street Journal what you think of this aspect of their "women's interest" reporting? Do it here. UPDATE: If you visit the site, the headline is still there, but the picture is gone. I find that blaming this entirely on Rupert Murdoch is very hard to resist. He probably chose the photo himself! While I naturally think this is overhyped, it does add to my fear of getting ridiculously famous. I'm pretty sure that there should be a rule against eating in public once you're a celebrity if there's even a CHANCE that someone could be looking. I remember seeing some news piece on candidates' eating habits when campaigning, and they made a point to emphasize how often people shove food in their faces at every stop as they travel. I guess it becomes challenging to turn down food from voters whose only immediate dream is to have their favoirite candidate try their town's famous double cheeseburger.